Note that apple green tip should occur app. 101 DD (Base 43), although obviously there is a range. We are at green tip today (11-April) in Belchertown. Based on the degree-day forecast, we will be at half-inch green in Belchertown on app. 15-April. • This WILL be your last Healthy Fruit (HF), unless go to the UMass Extension Bookstore (http://umassextensionbookstore.com) and purchase a new 2017 subscription to HF ($50, e-mail delivery only) in the next week or two. Alternately, you can send me (Jon Clements, 393 Sabin St., Belchertown, MA 01007) a check for $50 (tips accepted) made out to 'University of Massachusetts.' Make sure you note it is for Healthy Fruit subscription, and includes your e-mail address. You can also use this mail-in form to order Healthy Fruit and other UMass fruit publications. You can ignore this of course if you have already sent in your payment. Thanks. • What a difference a week makes. 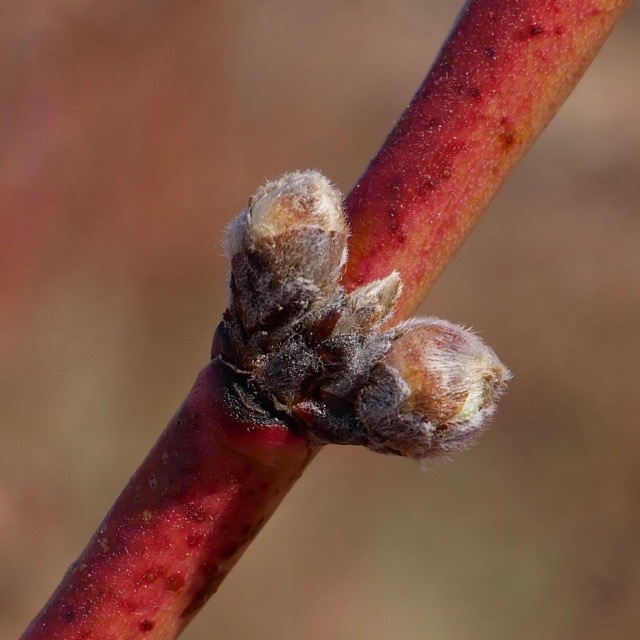 Last Tuesday the temperature pretty much flat-line at 39 degrees and fruit tree buds were pretty much in the same state as they were in late February when we had our last "heat wave." Now we are having another "heat wave." As the say in Vermont, there is winter, and then there is a few months of pretty "rough sledding." We'll be at half-inch green if not further along by the end of the week. Pest management recommendations pretty much stay the same for now, oil, copper, some mancozeb fungicide if it rains. Soon, the easy-season will be over. 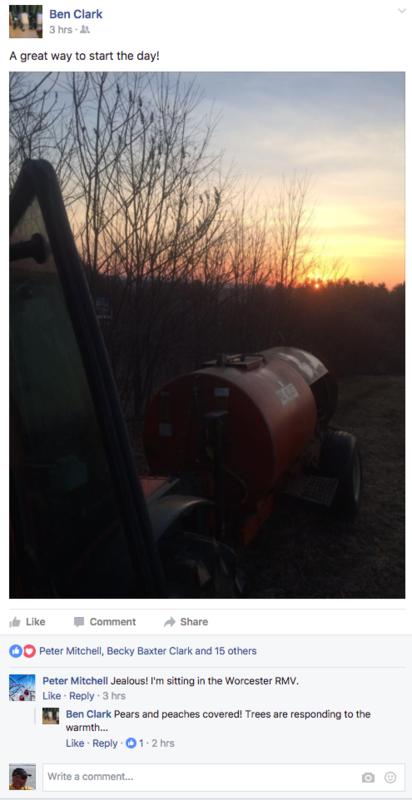 Horticulturally, finish pruning, start to think about fertilizer, plant trees in any dry spell (the sooner the better), and come to the twilight meeting at Bill Broderick's Sunny Crest Orchards tomorrow (Wednesday) evening at 5:30.
annual WPS Handler and Worker training required before any work starts! 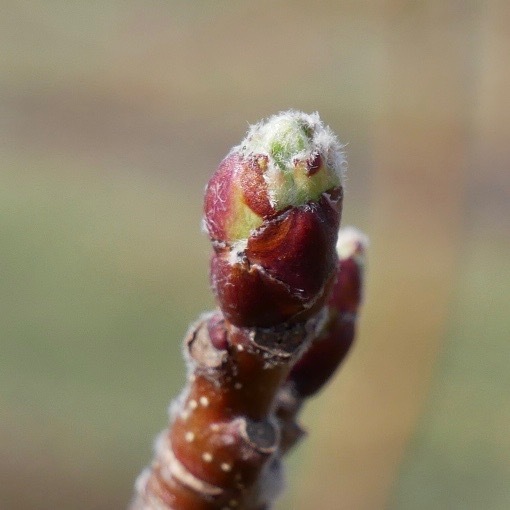 NOW, right NOW, yes NOW, is ideal time to be applying oil with copper to apples and pear for mites, scab, pear psylla, scale.1.5 to 2 % depending on bud stage is indicated. Copper and oil are compatible (check copper label though), but not oil and Captan. Do not apply oil within 48 hours of a frost/freeze event. (I don't see that in the forecast, but as you know, it changes daily.) GOOD LUCK! If it’s summer in April, can bloom be far behind? It’s unfortunate that we have this early heat, but there’s nothing we can do about it, except be ready for rapidly growing trees. One thing that sometimes gets lost during preparations for pest management is the order for streptomycin. 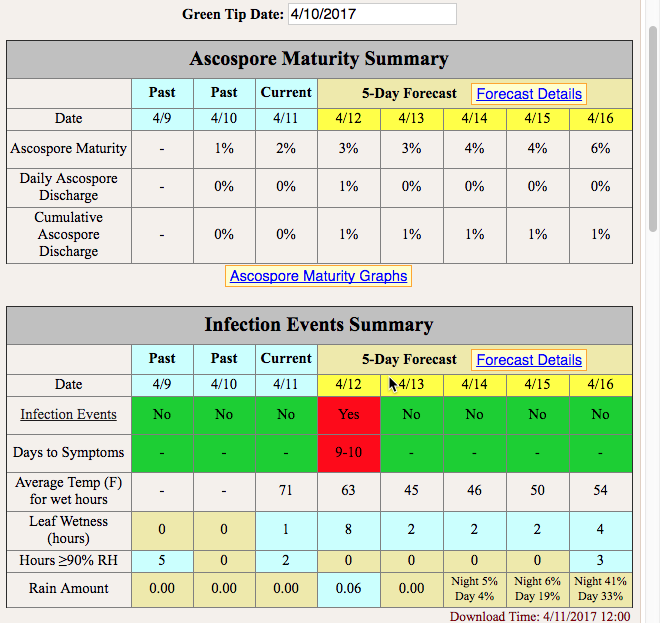 Unlike fungicides and insecticides, strep isn’t required every year. Rather than ordering it early, growers may wait until they need the strep before trying to buy it. But when bloom hits, this may be a problem. For one thing suppliers may not have a large supply, and if they sell out quickly, it may be days before they get more. In addition, strep needs to be put on in a relatively narrow window. It has about 24 hr. of post-infection activity, and protects only those flowers open when it is sprayed. 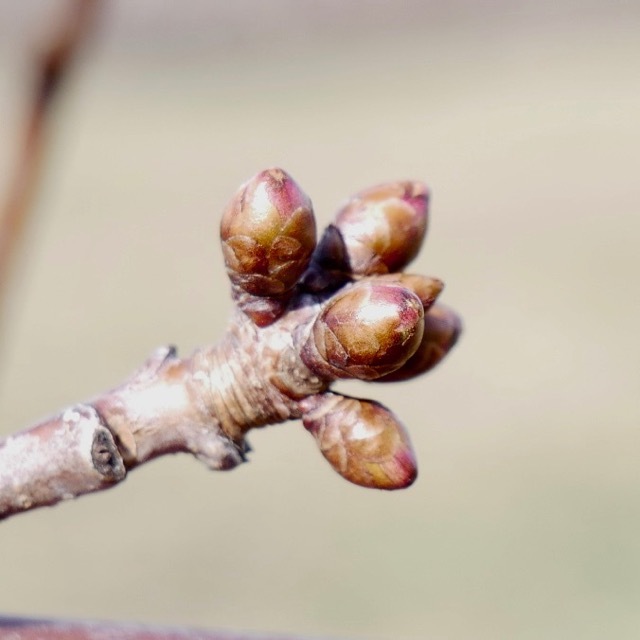 If bloom is moving quickly, as it does when it’s warm, blight-favorable weather, then it may be necessary to put on two or even three applications within a week. The good news is that streptomycin has at least a two-year shelf life. Given the serious consequences of fire blight, keeping at least enough strep on hand for an application to high-risk trees is a good idea. Ideally, the whole orchard should be treated when strep goes out, but having a reserve ready for rapid response on those Honeycrisps on M9 reduces risk of a major fire blight outbreak. Is it scab season yet? 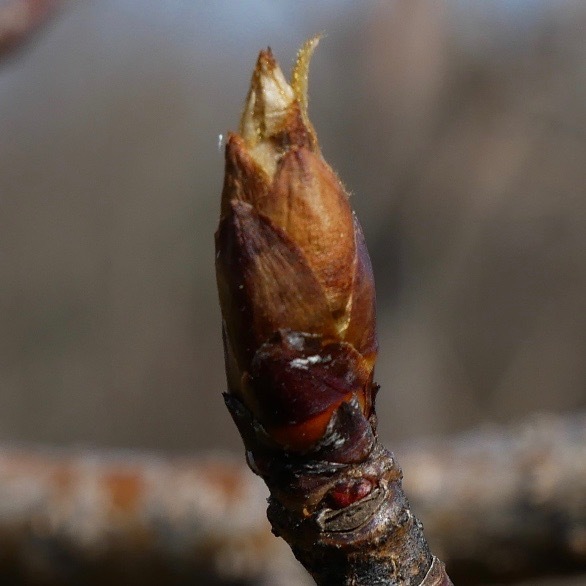 Our lab observations by Liz Garofalo so far indicate that there are a few mature ascospores in our overwintered apple leaves from western MA, but so far none have been captured in our release tests. That is, they look ready to go but aren’t quite there. This next week will probably change that, and we’ll see our first spores shoot out. With rapid tree growth, wetting on Wednesday or over the weekend has the potential to cause scab infection. If you have green tip or more, it’s time to spray. Ed. note: following are two RIMpro outputs as of today from Belchertown. 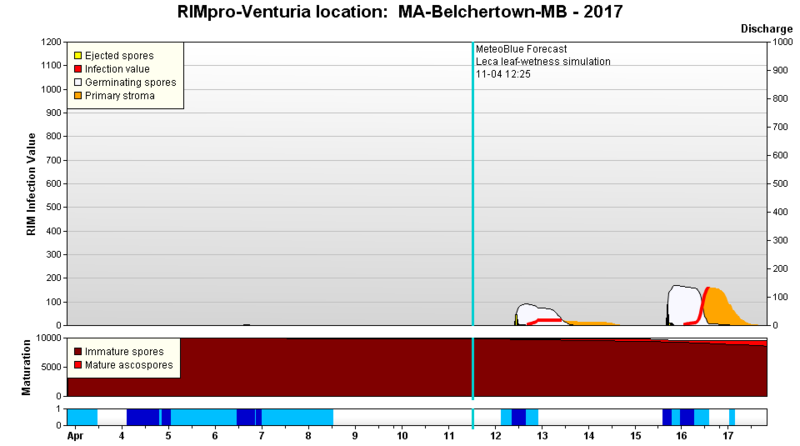 The first (Belchertown-MB) is based on 100% virtual data, the second (Belchertown) is using historical data from on-site weather station. Note they are pretty much in agreement, although the forecast for Belchertown extends out farther (FWIW). Note that a RIM value (red line) of less than 200 is considered a pretty insignificant infect. (I.e., clean orchard should probably not have to be protected with fungicide, depending on your risk aversion factor. Remember, it's only a forecast too, could change daily.) 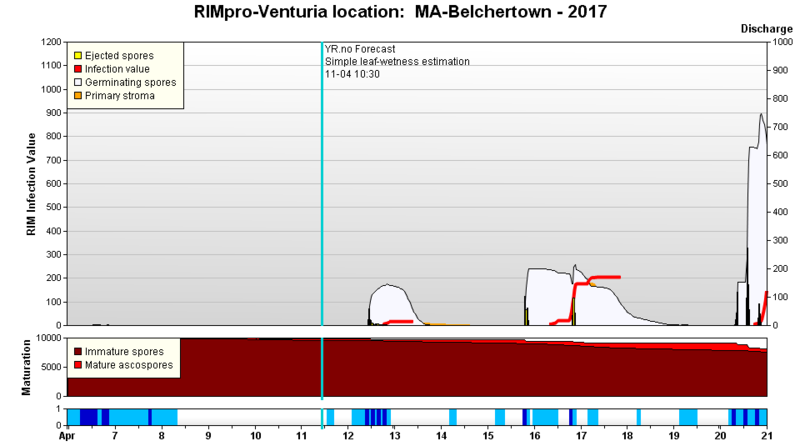 Following those is the current NEWA output for Belchertown. Do you know what your current apple scab/risk assesment situation is? 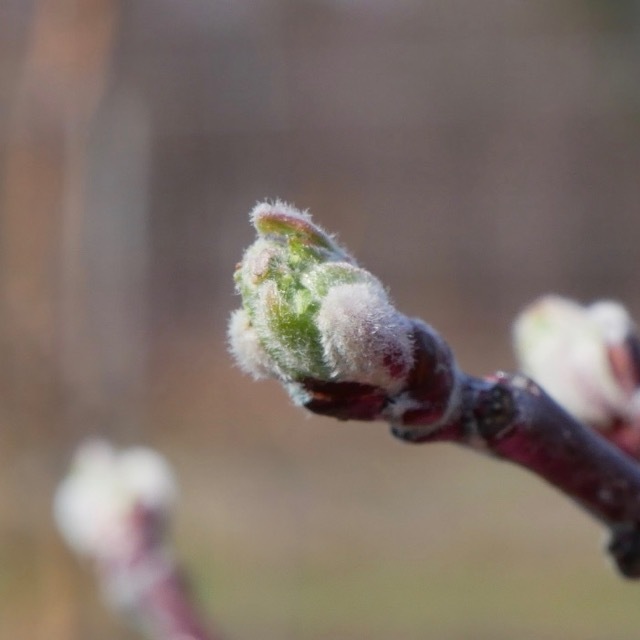 Not much to report here, as mentioned, peach and cherry pruning should be ongoing (or apples and pears if not done), trees can be planted when soil conditions permit (no mudding in!, make sure graft unions are high out of the ground! ), fertilizer applications can begin soon, and have some Apogee/Kudos on-hand to begin applications for growth control at bloom. Another scale we've been seeing in upstate NY orchards that might otherwise have been identified as white peach scale (Pseudaulacaspis pentagona) is almost certainly a closely related species (P. prunicola), which has the common name of white prunicola scale. According to scale authorities, this species is so closely related to P. pentagona that for years no one was aware that the white peach scale was not one but two species. Evidently, the prunicola scale is more common in temperate climatic zones, and scales found in upstate NY and New England will most likely be P. prunicola. 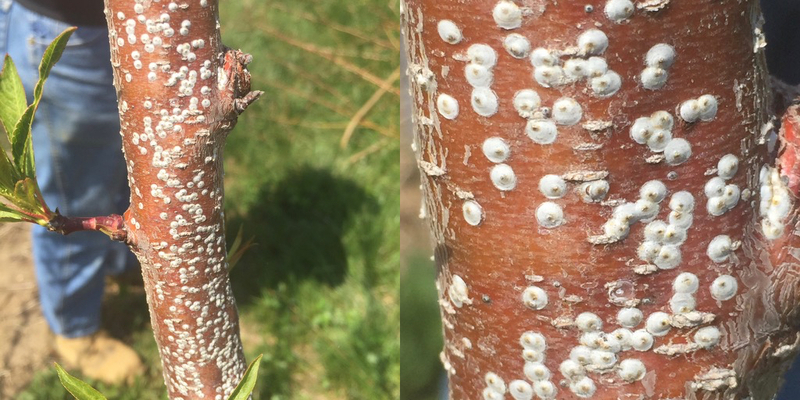 Infestations on apple and cherry as well as peach, are characterized by numerous white scales that cluster on the trunk and scaffolds, giving them a whitewashed appearance. Feeding reduces tree vigor, and foliage of affected trees may become sparse and yellow; heavy infestations can cause death of twigs, branches and entire trees if left unattended. This species overwinters as an adult female and deposits eggs in the spring. Horticultural oil is recommended as a dormant spray and insecticides can be used against crawlers in mid-June through early July (about 700–1150 DD base 50°F from March 1). Materials such as Movento or Centaur would be two good candidates at such a time. [Refs: Johnson & Lyon 1988, Insects that Feed on Trees and Shrubs; Davidson et al. 1983. Proc. Entomol. Soc. Wash. 85: 753-761]. I'm not aware of any intrinsic problem from mixing oil and copper EXCEPT in situations where hard frosts are expected within several days after applications or if any of the new copper formulations specifically include a warning about oil compatibility. Following freezes, anything on the plant surface will get sucked into cells as frost crystals melt. Either oil or copper alone can exacerbate frost injury, but I think that the two together are especially damaging (although I can't say I have personal experience or observations to back up the concept that oil+copper are worse than either alone when applications are followed by frost). One final issue: In general, copper sprays should not be applied with anything that lowers the pH of the spray solution, since acidic solutions will make copper more phytotoxic. I have never checked the pH of spray oils, but I have no reason to believe that the newer oils are any more acidic than what was used 35 years ago. And to complicate the pH question even further, the relatively new low-rate Magnabon copper (CS2007, as I recall) is formulated in a very acidic solution (pH in the high 3 to low 4 range, as I recall). I would not recommend this product at GT anyway, but putting such an acidic solution of copper with spray oil may (or may not?) increase risks of phytotoxicity. The next Healthy Fruit will be published on Tuesday, April 25 or thereabouts, 2017. (NO Healthy Fruit next week as I am on assignment, although there may be some "chunks.") As always feel free to get in touch with any member of the UMass Fruit Team (http://extension.umass.edu/fruitadvisor/team-members) if you have questions or comments.